No coding experience necessary. This guide shows you how to automate instagram likes, follows, and comments across 25 accounts for free. You can use this for easy guerrilla marketing, growing your small business from cold start on auto-pilot, or for spreading any other message. I’ve combined all the best bots you can build here to grow up to 50–200 followers per day. It only takes about 15 minutes to copy these commands into google cloud servers and run the bot. If you’d prefer to just buy a bot that works, I now personally use the Instoo Google Chrome Extension. It works in your browser, so it looks like just a regular browser user to Instagram. It’s impossible to detect and grows my account by 50+ followers/day. Click “Create Instance,” which is a server in the cloud, and fill out the details like in the image below. Micro instance, .6gb memory, and Ubuntu 18.04 LTS are the important settings. This will deduct $5 from your trial every month. Once the instance status is green in the dashboard, click “ssh”. This is what’s called a Linux shell in a server, but don’t worry it’s not hard to use. This is just like your Windows or Mac PC at home, but more functional for coding in the cloud(you can even make look like Windows if you wanted to). You can install and download the bot by pasting the code lines below into the Linux Shell window. This will grab open source code from Github.com to install your bot. You can copy+paste all the lines at once, or type it into the window line-by-line, and just wait 2 minutes for it to finish installing. 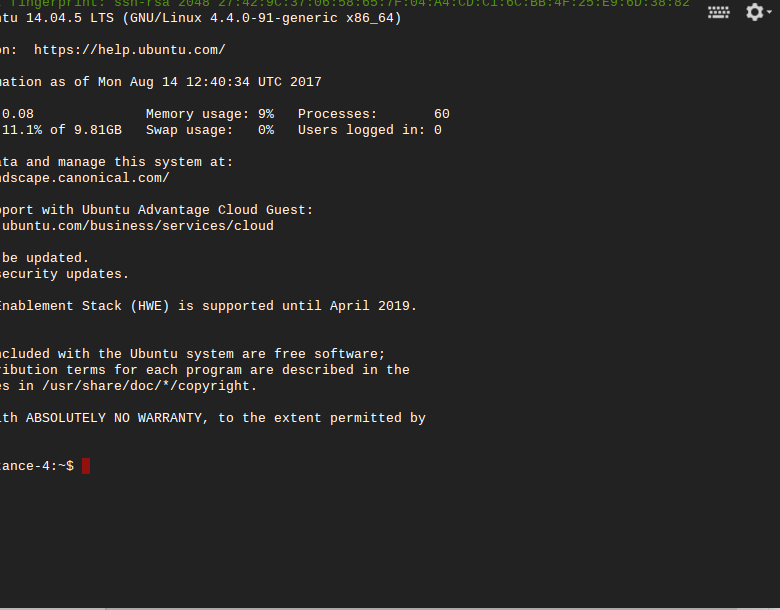 Hold CTRL+V to paste it in the Google cloud Linux shell window. Press enter after you paste in the last line. Get specialized Instagram proxies from instproxies.com. Copy the proxies for the next step. You can run up to two bots per proxy. The examples folder has many different kinds of bots you can run. Type “ls” in the Linux shell window to see all of them. This script likes photos from all the followers of the “dogsofinstagram” account. You can change the last parameter to any account to do the same. There are many different scripts to automate different things like welcome_messages when people follow you. Feel free to ask how they work. You’ll see it start to follow/like/comment like below! Once it logs in and you confirm it’s working on Instagram.com, hit “ctrl+c” twice. This script will ask you a bunch of questions about the speed and other settings. Enter all the answers like username/password/proxy/speeds into the terminal, and it will eventually log in to start! When you’re done, hold “ctrl + x” to exit, and hit “y” to accept changes, then “y” again to save changes under the same file name. You can see what’s going on with saving/exiting at the bottom of the screen in the nano text editor. to keep it running forever. Doing this will detach you from the screen session which you can later resume by typing “screen -r” into the linux shell window. Now you can close the window if you want, and the bot will keep running forever for you :) Check Instagram using your browser logged out to watch the following count go up. The next few sections include other bots that you can try. Skip to the end for best practices you can apply to any bot. Instabot.py is another bot that also works, but I prefer the easier to use Instabot above. First, follow steps 1–3 from above to set up a cloud server. Enter the following commands exactly into the Linux terminal window to install the necessary software. You can copy/paste them from here. Keep the comas, quotations, and other punctuation where it is, and just edit the setting like they’re originally formatted. Copy your proxy from the previous step into the “proxy” parameter. Avoid changing the frequency of things, as these are determined empirically to avoid Instagram bans. You can change the unfollow_per_day setting from 300 to 0. Once it logs in and you confirm it’s working on Instagram, hit “ctrl+c” twice and type “screen” to enter a detachable screen session, then “python3 example.py”, and finally Ctrl + A then Ctrl + D to keep it running forever. Doing this will detach you from the screen session which you can later resume by doing screen -r . Now you can close the window. Next, you can build up a bot farm that pings thousands of users per day. Creating new Instagram accounts is the hardest part, and you may be forced to use multiple phones/computers to sign up. Just be sure not to log in to the bot accounts on your own devices, and keep them in the Google cloud. Then change the username, password, and proxy parameters to be sys.argv, sys.argv, and sys.argv without quotes like below. The bots will all need to be verified within a day. This means you will have to log in to them and verify using a real phone number or email, but after that, you can continue running them. Since there’s been a lot of interest in setting up proxies, I’ve made the video below showing you how to do it and the last few steps in detail. This takes a while. While it runs you can get a proxy in the next step. After the bot installs, type the command below with different values for usernames, password, and proxy. and hit enter to run the bot with your own username and password! Use the proxy address proxy instproxies, and use port 3128. Configuring this bot is a bit more complicated than instabot.py. You can look in the quickstart_templates folder for more quickstart.py examples you can run or edit to your bot style. 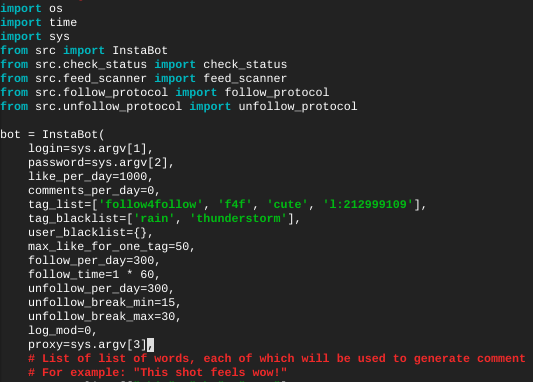 You just built an Instagram bot in a cloud server using open source software! You can stop here, or go further with some tricks. Instagram bans these bots if use the same IP for many bots, or do too much at once. You can grow a bot farm to thousands using proxies…. After a year, or when you’re done, simply stop and delete the instances in the Google cloud console. Age: Older/larger accounts can increase their automation speed to 1000+/day. Accounts under 21 days old without phone verification have a low bar to get detected. Accounts over 2–6 months old almost never get caught unless they blatantly violate the TOS. Links: Avoid identical links in your bio across multiple accounts. It gets flagged as spam. If you must link to the same site, use different domains that re-direct. If you must use the same link, use different domains that re-direct. Proxies: Instagram proxies make your bot look like regular Instagram users, rather than a google cloud server IP address, by routing your traffic through servers around the world. Don’t run more than 2 bots per proxy(because Instagram detects them all at once). You can grow bot farms to the thousands using proxies for on google cloud. Instproxies has the cheapest Instagram proxies I can find, and their customer support is great. Bot Farms: Each bot can send hundreds of people per day back to your business. If you use many bots, you multiply that traffic across different target audiences. This effect compounds over time as users follow and like your photos, and spreads even farther. Accounts: New accounts are less likely to get banned. You can buy accounts online that are phone-verified for botting called PVA accounts. You can use this script to create many accounts: https://github.com/FeezyHendrix/Insta-mass-account-creator Note, you will have to phone verify each of these accounts within the first day. Settings: Slow bots are less likely to get banned. Keep things to under 400/day. Don’t auto-comment. This is less effective than likes. Liking content makes it hard to detect bots, since anyone could like at any time, and people end up following you back or checking out your profile. After you’ve grown your account for a few months to look like a regular Instagram, it becomes impossible to detect. This is also true for “grandfathered” accounts that are old. You can also buy PVA(phone verified) aged accounts online, but I can’t recommend any since they’re all sketchy. Mentions: Create “satellite” accounts to avoid Instagram bans, and create a network in various side-niches that forward traffic to your main account through mentions “@main_account_to_mention”. You can grow a bot network of thousands of accounts that each grow in different crowds and feed traffic to your main account, all for nearly free on auto-pilot. A/B Testing Your Bot: You can optimize your bot for optimal growth by A/B testing different hashtags, comments, user targets, and content. Setup a test by changing one thing in your bot per week, and measure the engagement on Instagram. Avoid changing multiple things, which is called multivariate testing, because it only works well if you have a lot of traffic like facebook or google. If you improve engagement, keep the change. If you don’t, go back and try another change. Over many iterations of these micro-improvements, you can optimize your bots and Instagram accounts to grow thousands of followers per week. Through A/B testing you can grow your revenue even faster over time. Analytics: The best way to improve engagement, and in turn revenue, is to make your content more relevant to your users. How do you do that? The basic and most important way is to regularly post unique and related media, and avoid anything that doesn’t align with your brand. If you sell hats, don’t advertise for cars. The next best trick is to learn who your users are and make content that engages them. Posting more relevant media is guaranteed to get more engagement over time, and get shared more, which is the key to viral growth. 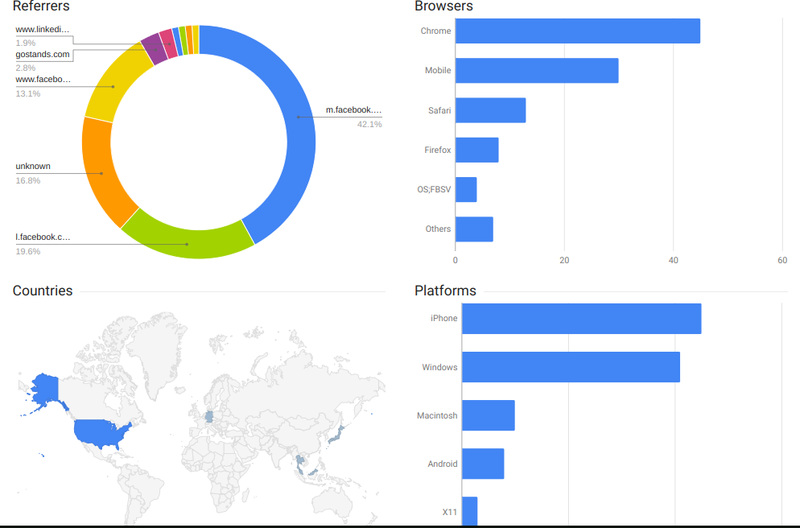 You can also use google analytics on your business website to figure out who your customers are, so you can start posting content relevant to them. How you use this is up to you. You can populate the accounts with photos before you start botting to spread a message or grow followers for a brand. 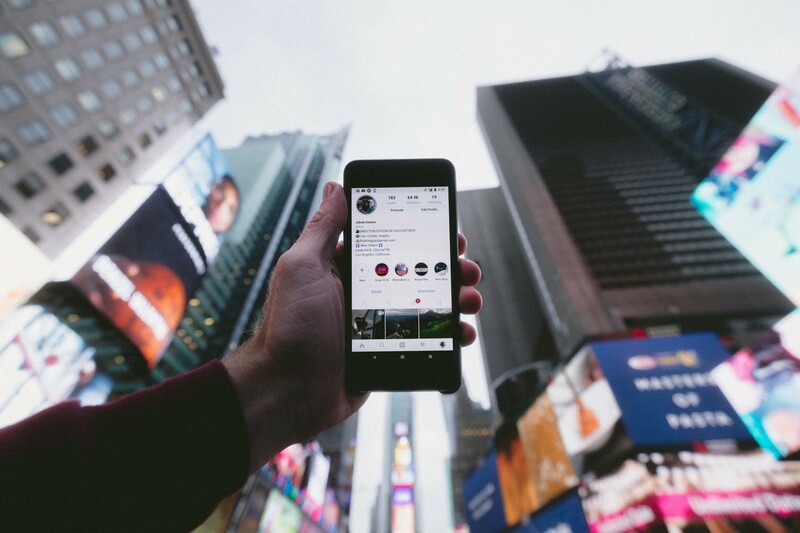 You can also grow “satellite” Instagrams that mention your main ones to feed traffic and followers to it, and the satellites can be in varied specific niches to test your ad targeting. Follow me on Medium for more neat tutorials. Good luck, and feel free to ask questions! I always respond.